WEST LAFAYETTE, Ind. – A startup is using Purdue University-patented technology to produce precise, customized medicine for pets. 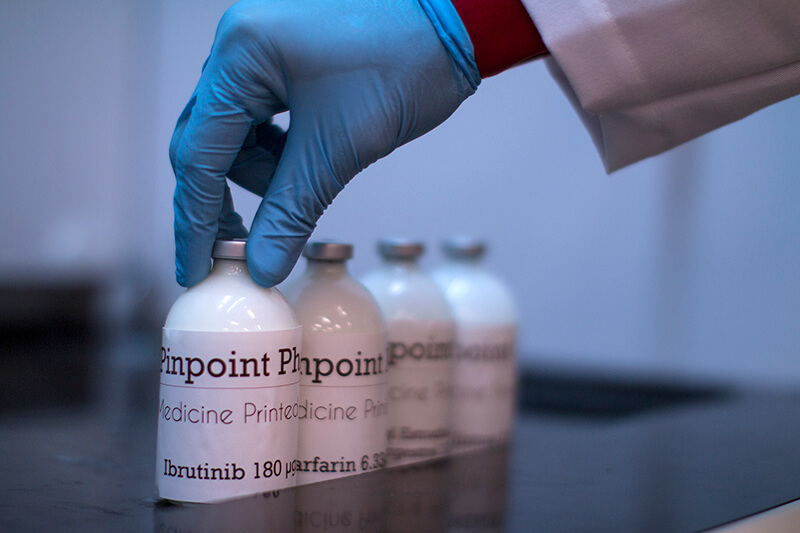 Pinpoint Pharma has created a printer that is faster than traditional methods of making customized medicine. The company is among three startups receiving assistance from the Purdue Foundry and eight startups from Indiana that will be featured Sept. 5-7 at the TechCrunch Disrupt SF Conference in San Francisco. Pinpoint Pharma is a precision compounding pharmacy for veterinarians, ensuring that the medicine tailored to each individual animal’s needs is easier for pet owners to give and for pets to take, which optimizes clinical outcomes. Arun Giridhar, Pinpoint Pharma’s chief executive officer, and three faculty members of Purdue’s Department of Industrial and Physical Pharmacy and Davidson School of Chemical Engineering founded Pinpoint Pharma two years ago, and have been joined recently by Angela Demaree, a nationally known veterinarian, who received her DVM from Purdue. 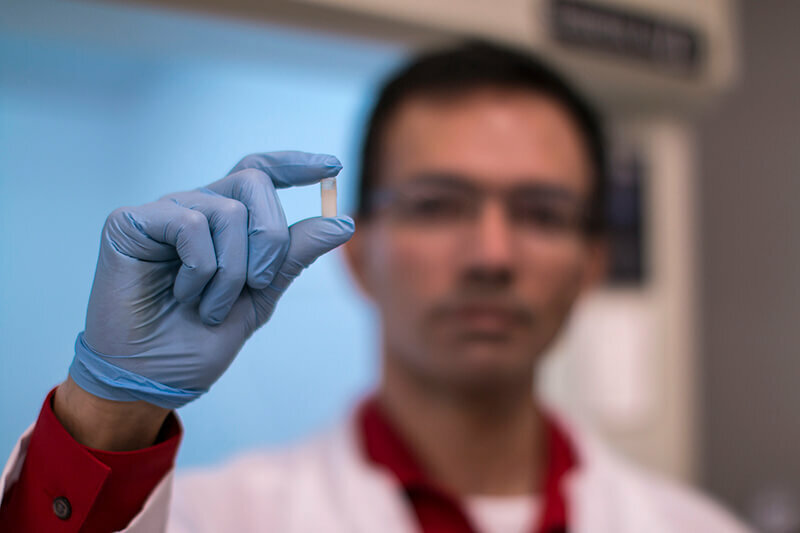 The goal was to create a device like an inkjet printer that could precisely dispense pharmaceuticals to meet a growing need for customized medication for pets instead of a one-size-fits-all approach generally taken. 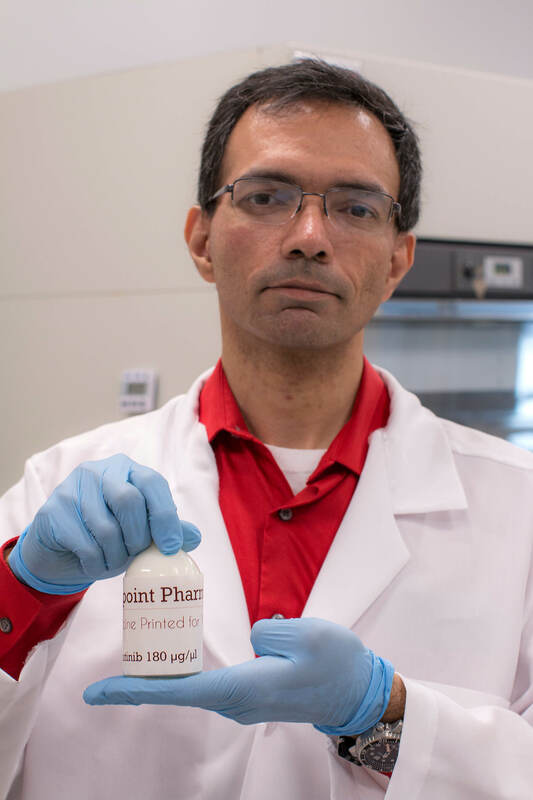 “When a pet has a specific requirement as determined by their vet, we can dispense the exact amounts and ratios of active ingredients needed for a pill, in a form and flavor that the specific pet will love,” Giridhar said. For pets, the one-size-fits-all method doesn’t always work. Giridhar said Pinpoint Pharma’s medicine printer has two advantages over other methods used to make customized drug products: it is faster and more precise. While it can take more than an hour to produce a batch of 100 to 300 capsules, Pinpoint Pharma’s printer cuts the total time per patient to 10 minutes, including cleanup, and is flexible on the product form suited to the individual pet. “We can make about one dose every second, or even faster,” Giridhar said. The printer also is more precise, using a tracking mechanism to record how many drops of medicine are dispensed in each dose and the volume of each drop, in real time. Typically making a batch of pills can have variances in potency between doses, Giridhar said. The printer also helps make potent medications that have a narrow therapeutic index, where small differences in dose concentration can lead to serious therapeutic failures or adverse drug reactions. “In such cases, it becomes important to dose very precisely,” Giridhar said. Giridhar said what sets Pinpoint Pharma apart is that the team has more experience in this field and the company has worked with a wide variety of medications. Earlier this year, the startup was chosen by gener8tor, a nationally ranked accelerator based in Milwaukee, for its gBETA program, a seven-week accelerator for early-stage companies with local roots. Pinpoint Pharma was one of five startups selected from 52 applicants for the inaugural Indiana cohort; gener8tor also operates programs in Wisconsin, Michigan, Ohio and Minnesota. 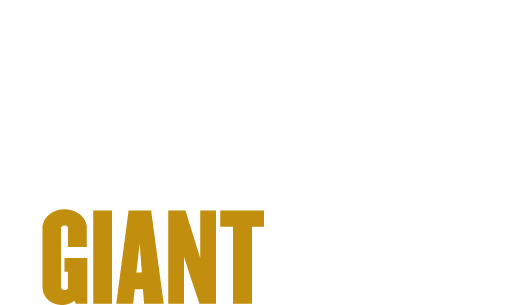 The program provides mentors, advice on business models and suggestions on ways to grow. It also gives the startups office space and up to $1 million in deals and perks from vendors. “Our experience with gBETA has helped Pinpoint Pharma move forward with our business model and develop new relationships with customers, mentors and investors,” Giridhar said.